This blog came about because of an answer I gave to a particular OP’s question. Therefore the code isn’t generic, it is designed for a specific situation, like most examples! However I hope there’s enough information here for you to follow what’s happening. Please note this is video number “4” this is a recap of what’s been done. This video comes after the 3 videos below, Video’s “1”, “2” and “3”! I’ve put it HERE at the beginning to whet your appetite so to speak! Generating an invoice for each customer, using a “Main Form” to run a Record Set Loop (RSL) the record set loop loops through the SQL statement. The SQL statement is rendered unique by a value collected from the field. The SQL statement gets passed into the forms Public Custom Property. The code opens the Report. 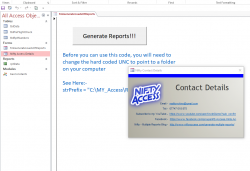 The reports Open Event extracts the SQL Statement from the Forms Public Custom Property. The SQL Statement is then passed into the Report’s Record Source. Generate multiple copies of the same report but with individual criteria for each report provided by an SQL statement. The requirement is for Reports with Ascending numbers in the Report Name. Generate multiple copies of a Report with individual Criteria for each Report. Demonstrates how to change the Record Source of each Report, on each iteration of the Recordset Loop. Show how to use a Combo Box in the Report to display text from a related lookup table. Show that the recordsource SQL statement has a different value. Add a custom property to the form to hold the SQL Statement, the SQL Statement will be generated by a function in the Form. The Report will then interrogate the form, grabbing the SQL Statement from the custom property. Demonstrate how to insert Text straight into the Form Module. A Public Custom Property for holding the SQL Statement. See how to insert text straight into the Report module, a Public Custom Property for holding the name of the Form that Opened the Report. Shows how the Report On Open event extracts the Form name from OpenArgs. Demonstrate how you can use the Reports Open Event to use the DoCmd.Close command to close the Form that Opened the Report. CreateObject(“Outlook.Application”) Don't Work, Now What?